A Citrus reticulata Blanco cultivar. It is a spineless tree with ascending branches, dark green, glossy, ovate leaves and small white flowers followed by variable, edible, round, orange fruit, typically with loose, thin skin. To 5m. [RHSD, Hortus]. The Mandarin was figured in Andrews' Botanical Repository pl. 608 (c.1810). ‘The drawing of this remarkable Orange, which has so long been a desideratum in this country, was taken at Wormley-bury in the beginning of last May. 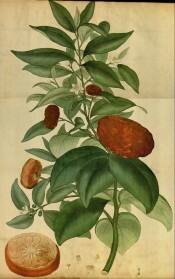 The plant is a native of China, and Mr. Barrow informs us, that he found the fruit very common when on his travels in that country, and in much higher estimation than the common orange by the Chinese, who call it Mandarin Orange, (answering nearly to the English epithet of noble) by way of pre-eminence. The same gentleman also informs us, that he found some fine trees of it in the gardens at the Cape of good Hope; it is therefore more singular that it has been so long in reaching this country. From Loureiro’s description of his Citrus nobilis, there can be little doubt of its being intended for the Mandarin Orange; which, he informs us, grows to a moderately sized tree, and particularly notices the superior excellence and the depression of the fruit, whose common size is about five inches across. The plant at Sir Abraham Hume’s is as yet only about five feet in height, and was imported from Canton in 1805. It is easily distinguished from the common Orange, both by its curious form and internal structure, the pulp adhering so loosely to the rind as to be separable from it by the slightest effort, and leaving in many places a considerable opening between them’. The plant described by Andrews is now considered not to be related to Lourero’s tree. A recognised synonym is Citrus nobilis Andr. non Lour. ‘The so-called Mandarin orange said to have been introduced from China into England in 1805 by Mr. Barrow and now grown in all the warmer parts of the globe is undoubtedly a native Chinese species though probably improved by selection through centuries of cultivation. Andrews mistakenly identified this plant as the typical Citrus nobilis of Loureiro in spite of the fact that the plants introduced by Mr. Barrow came from Canton where Loureiro did not find the C. nobilis already familiar to him in Cochinchina. Tenore noting the wide divergence of this plant from Loureiro's description considered it to be a distinct species and named it C. deliciosa. It is probable that Blanco's C. reticulata is the same thing but the application of this name is uncertain since Blanco's type specimen is lost. It is still a matter of doubt whether the mandarin orange is merely a variety of Citrus nobilis Lour. or a distinct species, as there are a number of other rather diverse varieties such as the "tachibana," a wild, sour form from the Liukiu Islands, and the Tangerine, a red-fruited, large-leaved form probably of Chinese origin, now widely grown in warm climates. For the present it seems best to consider all of these as well as some at least of the Suntara, Keonla and Jambhiri oranges of India (Bonavia, Cult. Orang. Lemons India, 44-62, Atlas, t.114-138) as constituting subspecies or varieties of one very variable species. Better knowledge of this complex group may resolve it into several closely allied species connected by hybrid forms that have appeared in cultivation. Many, in fact most botanists have considered this plant to be the typical Citrus nobilis Loureiro, but an attentive reading of Loureiro's description will show that he had a quite different plant in mind, doubtless some orange of the King type.’ [E. H. Wilson - Plantae Wilsonianae vol.2, p.143/1916]. Listed in all published catalogues as Mandarin ditto (large) [Orange Tribe no.9/1843]. ‘Mandarin ditto’, following two seedling oranges in the 1843 catalogue, implies a seedling Mandarin. One Mandarin tree was presented to the Sydney Botanic Garden on 27th September, 1847. [RBGS AB]. Hybridisation between a rather small number of ancestral forms of cultivated citrus seems to have occurred millennia ago, and, as the hybrids are usually fertile, has continued ever since, leading to a wide range of forms throughout tropical and sub-tropical regions, particularly in Asia. The vast number of common names that have been given to varieties of orange over the centuries, together with almost as large a number of botanic and quasi-botanic names of more recent times, makes differentiation of varieties of citrus quite difficult. For a thorough review of citrus names see ‘Sorting Citrus Names’ - www.plantnames.unimelb.edu.au/new/Citrus.html. In the Hortus Mandarin Oranges and the Tangerine are included under the name Citrus reticulata Blanco, although this name is not accepted by all authorities. Citrus nobilis Lour. is commonly used for some of the large Mandarin Oranges, particularly those known as King Orange or King Mandarin. Macarthur’s ‘Mandarin Orange Large’ may well fit this category. Citrus nobilis Andr. non Lour. Citrus aurantium L. var. mandarinum Perr. Citrus aurantium L. var. begamina F.-Ville.